Good day everyone! 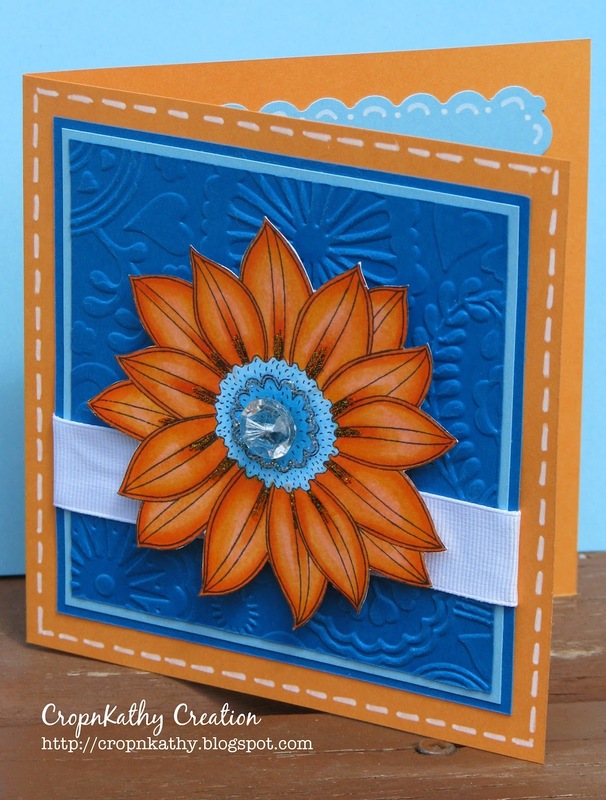 I have a flower card to share with you today that can be used for any occasion. I was inspired by all the new things blooming in my garden today. I just had to make a quick card while on my lunch break to celebrate all this beauty that is surrounding me. Hope you enjoy my card! (FYI - the deep blue has a touch of turquoise to it, but no matter how I photographed it, the bright and brilliance of the blues just aren't quite the same). Inside of card and side view to show the dimension of the flower. Close up of flower . . . This is gorgeous! I love that flower image and your bright colors!!! Gorgeous card, stunning colours and I love that flower. Thanks for joining us at TG this week. OMG your scrap room is to die for!!! Your card is adorable! Thanks for stitching with us at Frosted Designs!! Gorgeous colour combo, and that flower is beautiful. Wow, wonderful card!! Beautiful flower and excellent summery colours. I saw your project on *Take it Monday* and I am charmed with it! Beautiful card such vibrant colours,thanks for joining us at Penny Black at Allsorts. A beautiful and vibrant card Kathy. Oh what a gorgeous and cheerful card. I love the rich colours and this stamp is a definite new favourite of mine. Such a bright and cheerful card! It caught my eye at Make it Monday. Just gorgeous card, love the colouring! Gorgeous card, wonderful colours and colouring. Beautiful flower and excellent summery colours. Absolutely gorgeous, great combination and I impressed the inside of the card as well. Stunning card. Your colours and papers are really beautiful and there are no any single mistakes you done. A single flower increase the look of your blog. Dad Card and a win!